Harper’s Bazaar Netherlands appears to have skipped an issue, missing out on October. The magazine premiered on our forums with three wonderful covers for September, and now, out of nowhere, comes the November cover. The newly-formed Dutch title welcomes Kim Noorda back into the spotlight, who was photographed for a portrait image by Mikael Schulz. Members of our forums are more than satisfied. “Really nice! I was excited to see their second cover and I’m not disappointed at all. 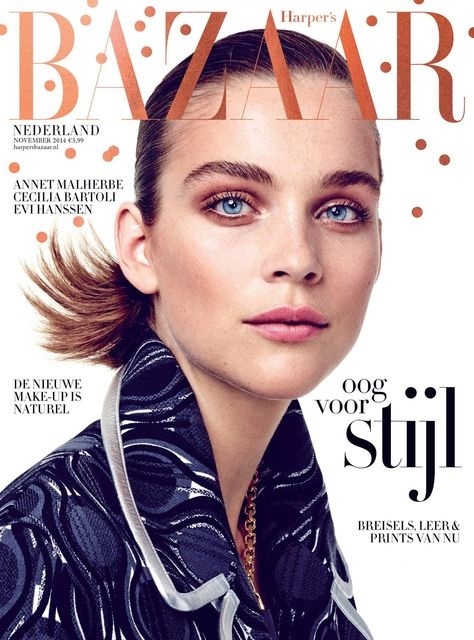 Harper’s Bazaar Netherlands looks promising,” raved Oxymore, kicking off the thread to an encouraging start. “Such a charming cover! It’s lovely to see Kim Noorda. Everything is on point to me,” complimented Valentine27. “I have always been a fan of Kim and it is so good to see that she is doing well. This is very autumn, the jacket in sync with her blue eyes, the brown makeup and the text, plus there is so little text which is so rare these days, but they get the point of having such a beauty like Kim on the cover they don’t need to put too much text all over it. Yes for Harper’s Bazaar Netherlands,” proclaimed lalatran. An element of the cover was bothering a few members, however. “Well, it’s certainly a striking cover and I like the ponytail. Just don’t see the need for confetti, they’re either too late for their own launch party, or too early for a festive mood,” commented Benn98. Does the post-production confetti bother you at all? We think it’s a cool design and contributes a little something else to a plain white background. See inside the thread and share your own opinion here.